I love all things protein and love trying out new sources and methods of incorporating it into my diet. I’m not a carb hater (hello?? potatoes??!!!) but I know my body and blood sugar levels adore protein. If I could have a side of beef at every meal, I would. But I do like my clear arteries and having enough money to put gas in my car, so that option is not favorable. What I love most about this is that it’s a complete protein. 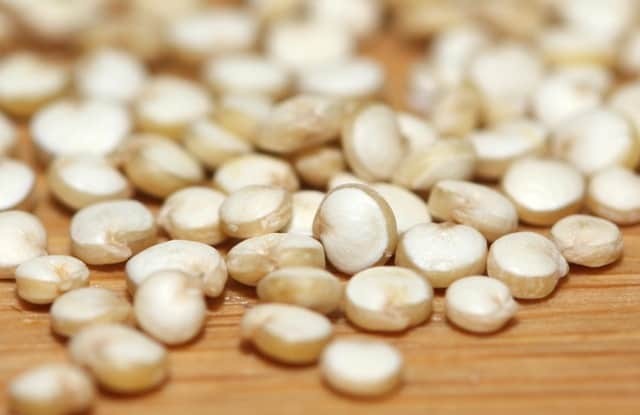 This tiny seed contains adequate proportions of all 9 essential amino acids that are needed for human nutrition. This is a fancy way of saying it’s healthy and good for you. Very few foods fit this description and most plant sources of protein must be combined with other sources to make a complete protein. Protein combining is crucial to energy transfer. 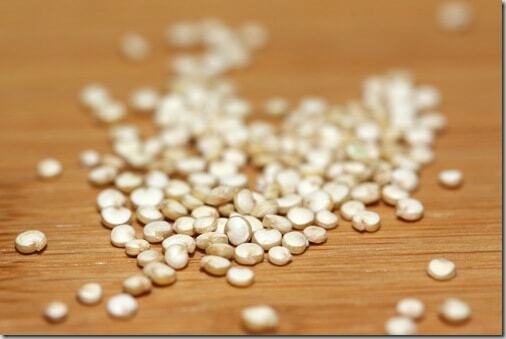 I use quinoa like I would rice. True enough, it probably wouldn’t work for rice and gravy like we do here in the South. 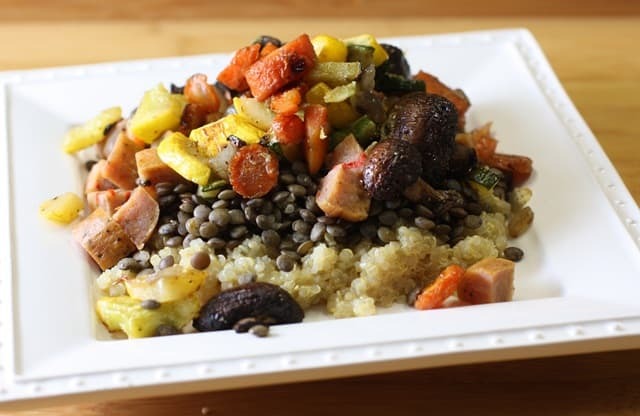 But it is a yummy base for any vegetable stir fry, roasted vegetables, salads, wraps, or plain cooked in vegetable stock and lots of herbs. It can be used for a sweet breakfast cereal with berries and honey. Savory or sweet, it’s a great starting point. First rule: RINSE IT OFF! 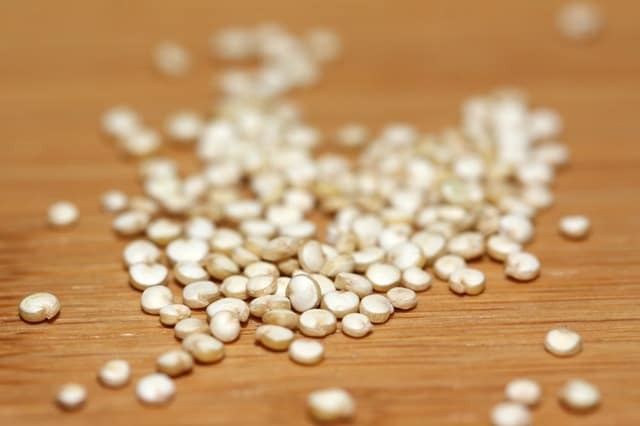 Quinoa seeds have a coating of bitter-tasting chemicals called saponins, that make their seeds less-palatable to birds and other seed-eaters. Saponins are mildly toxic, and must be removed. I use a fine mesh sieve and rinse under cool water for about a minute. Some recipes call for soaking and rinsing for longer amounts of time, but I’ve never had a problem with a quick rinse under water. Liquid ratio: 1 part quinoa to 1 and 1/4 liquid. 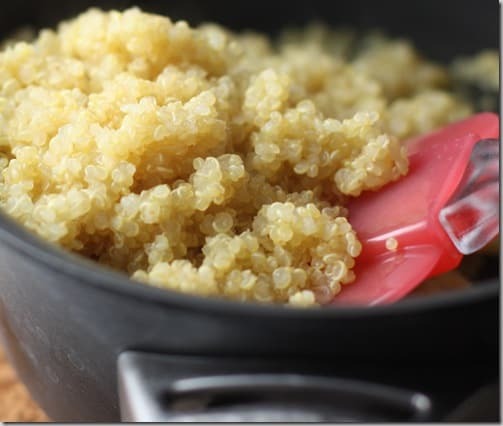 For 5-6 meals, I use 1 cup of quinoa to 1 and 1/4 cup of stock. I always cook mine in some form of stock just for extra flavor. Bring to a low simmer, reduce heat to low, cover and cook 30-35 minutes. Remove from heat, keep covered for 5 minutes. Then fluff with a fork. These are TINY! Make sure you use a fine mesh sieve to rinse. I used my macro lens to get this shot. 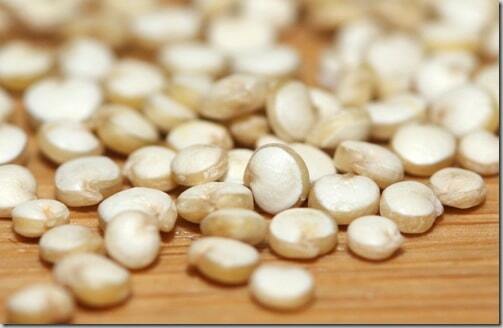 They have a thin ring around each seed that will retain a light crunch after it’s cooked. Fluffy cooked quinoa and tons of protein goodness. Top with just about anything. This is lentils, roasted vegetables, and chicken sausage.